9 November is an auspicious date in the German historical calendar. 80 years ago this was the anniversary of Kristallnacht (the Night of Broken Glass) when synagogues were burned and 10,000 Jewish males were marched to concentration camps. It was the first step on the road to the genocide of millions. 28 years ago it was the day that the GDR authorities announced the dismantling of the Berlin Wall. However, a century ago it was also the date when the Kaiser announced his abdication in the face of a workers’ revolution which had begun with mutinies in Kiel before spreading across Germany. It was one year and two days after the October Revolution had brought the working class to power in Russia. For the Russian revolutionaries the outbreak of the German Revolution brought an end to the agonising debate over the signing of the Treaty of Brest-Litovsk eight months earlier. Those who had argued that this Treaty would allow the German government a new lease of life and strangle the German working class had been proven wrong. The German revolution, which Trotsky, Lenin, Bukharin, and indeed the entire Russian revolutionary working class, had counted upon to turn their audacious act of October 1917 into a real world proletarian revolution, was now on the march. Or so it seemed from several hundred miles away in Moscow. In reality the situation was much more problematic. The question now for the German ruling class was how to get out of a lost war with the minimum of damage. They put their faith in President Wilson’s Fourteen Points for a “just a lasting peace” announced in January 1918 as a deliberate propaganda response to the Russian Revolution. Lenin’s first Decree on Peace had raised a banner for the world working class and thrown down a challenge to the imperialist order. Wilson’s Fourteen Points were intended to neutralise this appeal of the Russian Revolution to the world’s workers. The German Generals, reactionaries to a man, now tried to use this piece of democratic propaganda to get out of the war. However it soon became clear that neither they nor the old imperial regime would have any credibility in discussing a “democratic peace”. Thus they consulted the leaders of the majority Social Democratic Party. This was not new for them. They had discussed with them before the war to ensure that the Social Democrats would not sabotage the war effort and were rewarded, when, to the astonishment of the world, the German Social Democratic Party reneged on its own past (“not a man, not a farthing for this system” their leader August Bebel had announced years earlier) and on every international resolution it had agreed to, in voting a war budget for the Kaiser . The party signed up to the Burgfriede  with the Kaiser. Thus German workers were disarmed overnight. In the meantime the revolution was on the march. Hamburg, Bremen, Hanover, Brunswick, Cologne, Munich, Leipzig, Dresden, Chemnitz, Frankfurt, Dusseldorf, Stuttgart, and about 100 towns, all followed Kiel in setting up workers’ and soldiers’ councils. Germany’s petty princes were now driven from their palaces. On 9th November they were joined by the Kaiser himself. 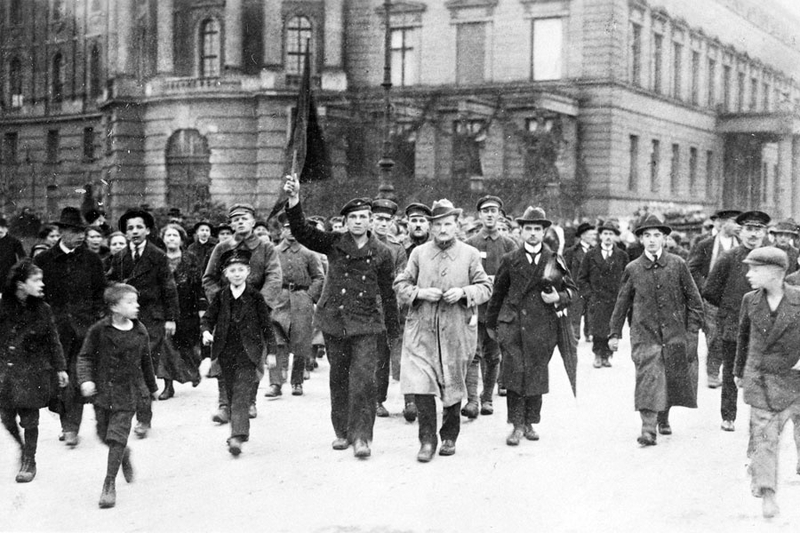 In Berlin, workers took to the streets led and organised by the Revolutionary Obleute . The police gave their arms to workers and soldiers left their barracks. Some officers did fire on workers (three were killed) but most recognised that further resistance was futile. By lunchtime, Prince Max of Baden, the Prime Minister, was announcing the abdication of his cousin, the Kaiser. The next day he resigned and handed over to Ebert. This is one of those issues where the combined actions of all the participants end up creating a tragedy. Having failed to break with Social Democracy early enough, there was no body of common experience amongst the various delegates of the KPD. Add to that the tradition of German localism and you end up with a party which designs a Zentrale to lead it but without ascribing precise roles to its members. The KPD as a whole rejected parliamentarism as the way to socialism, but there was disagreement on whether to tactically participate in elections to the new National Assembly. The abstentionists triumphed in the vote despite Rosa Luxemburg’s intervention in favour of participation. Luxemburg and her allies were appalled (she is alleged to have asked Liebknecht “what had become of [their] programme?”) but they were caught between a need to defuse the situation and a desire not to abandon the workers who were already on the streets. Radek, who was present in Berlin, called upon the KPD leaders to repudiate the movement saying it was just like the July Days of 1917  in Russia. But then the Bolsheviks in July 1917 managed to tread a fine line. They neither denounced the movement nor ever quite went along with it. This itself had been no tactical masterstroke since it still led to the suppression of the Party. Only the fact that the Bolsheviks had already put down roots inside the working class meant that they could hold on and recover. Without those deep roots in the working class, the July Days would have been an utter disaster rather than a temporary setback. The KPD still had to put down those roots, and in this crisis it did not even have control over its own forces on the ground, let alone those of the USPD. Its late appearance and its failure to sort out both a clear organisational structure, its indiscipline, plus its lack of a body of practice in the face of the devious defence of capitalism by the so-called “socialists” of the Majority SPD, meant it was largely unprepared for the complex situation of 1919. The German proletariat was to pay a heavy price for this. From the medieval German tradition where any knight could enter any castle or town provided he swore to uphold “the peace of the castle” or burgfriede. Militarism and Anti-militarism. It was based on a speech he gave in 1906. He was tried for treason and gaoled for 18 months during which time the workers of Berlin elected him to the Prussian Landtag, and later, to the Reichstag. Quoted in A.J. Ryder, The German Revolution, p.82. Obleute is usually translated as “shop stewards” but these were more like coordinators of sections of workers in the Berlin metalworking industry. Politically they were close to the USPD leader George Ledebour so the “revolutionary” label has to be considered with care. [10 Taken from the appendices to Rosa Leviné-Meyer, Leviné, Life of a Revolutionary, Saxon House, 1973, p.189ff. Trotskyism in its various shades has always suffered from this illusion and this was why Trotsky himself showed the way with his “French turn” in 1935 where he urged Trotskyists to go into Social Democracy to work secretly to radicalise it. This version is taken from The German Revolution and the Debate on Soviet Power, Pathfinder, 1986, pp.119-121. See Werner Angress, Stillborn Revolution, Princeton 1963, p.35.